I'm excited to LAUNCH a new blog series today: Have Swag, Will Travel: Tips for Planning Book events. Like my other recent series, Birth Stories for Books, this will be a collection of guest posts from other authors and illustrators, in this case sharing their experiences planning and implementing book events (versus sharing their paths to publication). 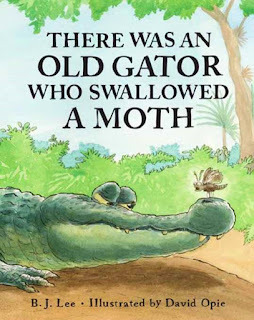 Today's guest is author, B. J. Lee, sharing her experiences as she prepares for the February 1, 2019 launch of her debut picture book, THERE WAS AN OLD GATOR WHO SWALLOWED A MOTH, illustrated by David Opie. It's only recently, with the publication of my first picture book, that I’ve come to appreciate book swag. 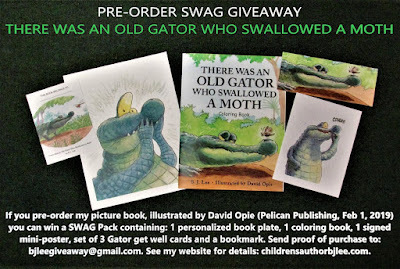 THERE WAS AN OLD GATOR WHO SWALLOWED A MOTH, illustrated by the fabulous David Opie, releases February 1, 2019 from Pelican Publishing. Needless to say, I’m in book promotion mode and a big part of book promo is SWAG. Have SWAG will travel! Because I read it was important to get your cover in front of as many people as possible, most of the swag I made has the book cover on it, including business cards. I was also sure to include information about myself as an author, my website, and some social media contacts on the back. 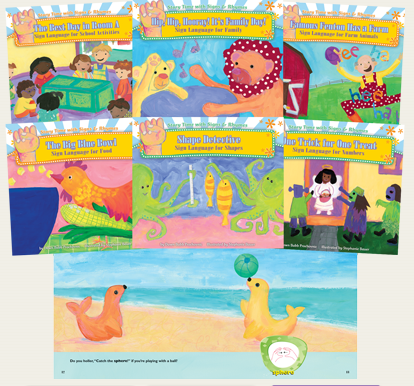 And then I put my book cover on my website with links to retailers, including my favorite local indie, Tombolo Books. 3. Are you the illustrator? 4. Did you draw this picture? So on the second batch, I tried to be very clear! I hand out cards everywhere I go, to young kids in Trader Joe’s and their moms, to my doctor’s receptionist, to my doctor, to people I meet in the park. I figure everybody that I hand a card to will have information about my book and will have the book cover image in their mind. They may be interested in buying the book, they may not, they may put it on the refrigerator, they may pass it along to someone else. It’s all good! The image is out there in the world. The information on how to order it is on the back. Then I made some bookmarks. I included an elongated cover photo on the front, but not the title. I put the title and the other information on the back, thinking that bookmarks might be more appealing to people without being so “selling.” I give these to librarians, along with my business card, and I leave bookmarks at the circulation desk and in the children’s section, if permitted, so folks can just grab them. Then I experimented with postcards. Since my husband has some printing experience, he said that people are not going to want a postcard with the title on it so, as with the bookmarks, I made postcards with images on the front and wording on the back. I chose three scenes from my book and in subsequent printings, reprinted the two most popular. I was sure to leave plenty of room for people to write on and address. The idea behind postcards is that people will think it's a cute image and send it to someone, thereby spreading my cover image and information to others. I also got an ingenious idea from bookseller Stefani Beddingfield at Inkwood Books in Tampa. I was showing her images from my book and we were chatting about note cards, as I was interested in maybe making some. She said that unless an image was tied to a holiday or a theme that is typically seen in note cards, they won’t sell. For example, the image of my cover would not sell as a note card. 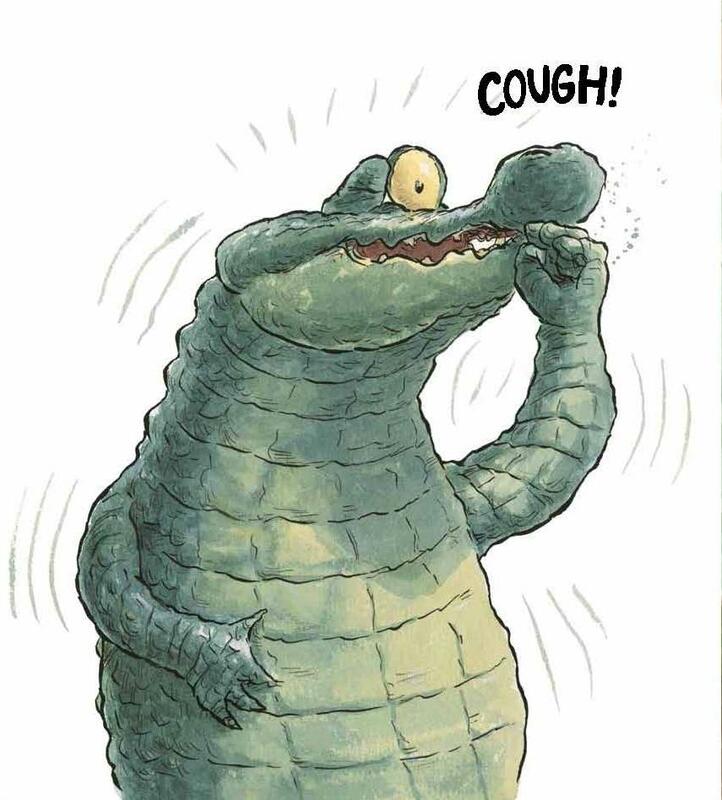 Then she saw the following image, and she said, “These would make adorable get well cards.” And so the gator get well card was born. Swag was also instrumental in helping me navigate my book launch. I took my images around to booksellers to see if they would be interested in doing a launch with me. I also took them to Boyd’s Hill Nature Preserve because: gators. They loved the gator character and, when I showed them the paperback version of my book that I printed from the e-galley, they really embraced it. 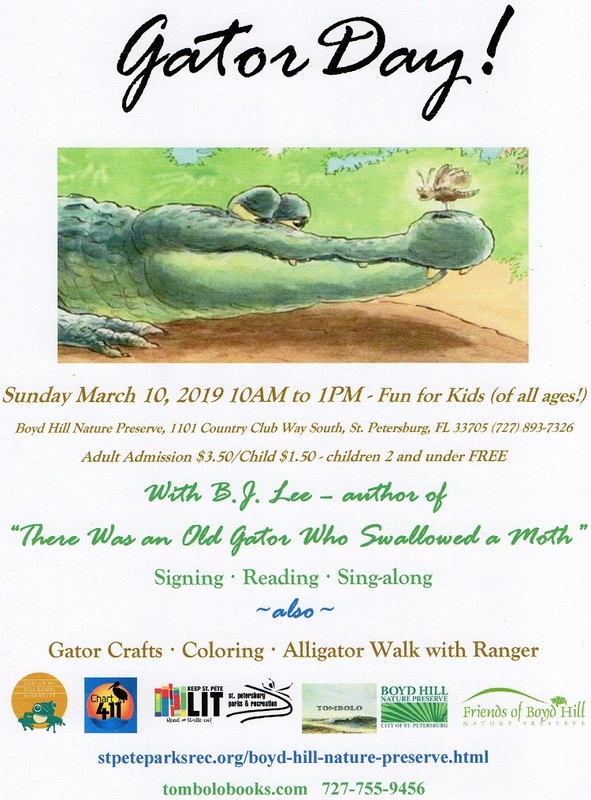 They suggested having a Gator Day in conjunction with their already-existing alligator walk event, which would include a book launch, education about alligators and even a live juvenile alligator. Local bookseller Alsace Wallentine of Tombolo Books has agreed to partner with me for this event. And all of this came together because of – SWAG! You can order a signed copy of my book from Tombolo. 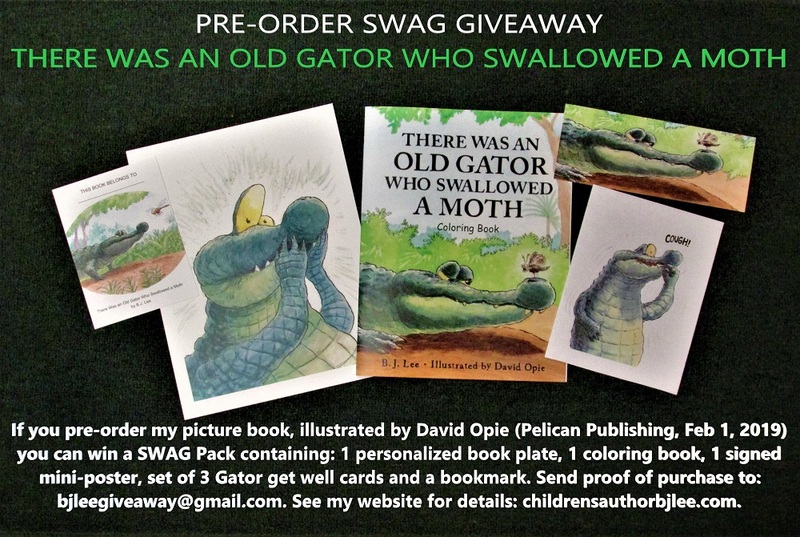 I'll be having additional swag at my book launch including signed posters as door prizes, bookplates, coloring books which the illustrator, David Opie, provided black-and-white images for, and I’ve ordered a gator doll/character from a local crafter. I’m currently having a preorder swag giveaway party on Facebook and Twitter. You can enter to win fabulous swag, now through January 31st! Find details on my website. If you will be in the Tampa Bay area of Florida on March 10, 2019, stop by Boyd Hill Nature Preserve, to hear me read, possibly sing, and pick up a signed book. The gator festivities start at 10 AM. Swag is a wonderful thing! 1. It can show people what your book is all about. 2. 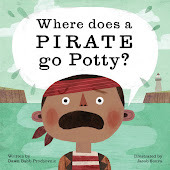 If your picture book is character driven, it can communicate your character to people. 3. It can make people rally around you and your book. 4. It can bring disparate groups together to work for a common goal. Thank you for having me on your blog, Dawn. It’s been a pleasure. Thank YOU, B. J., for a really informative post! I've learned so much. I especially love the idea of the Get Well cards, and it's fabulous to SEE so many great examples of the materials that you've put together to get the word out about your book. Let us know how Gator Day goes! And now, dear readers, head on over to B. J. 's website to get in on the SWAG giveaway before it ends, January 31, 2019! And...if YOU have tips to share about planning book events, please get in touch via the comments or the "contact" link to the left so we can hear YOUR Have Swag, Will Travel story! B.J. Lee is a former college music librarian turned full-time writer and poet. 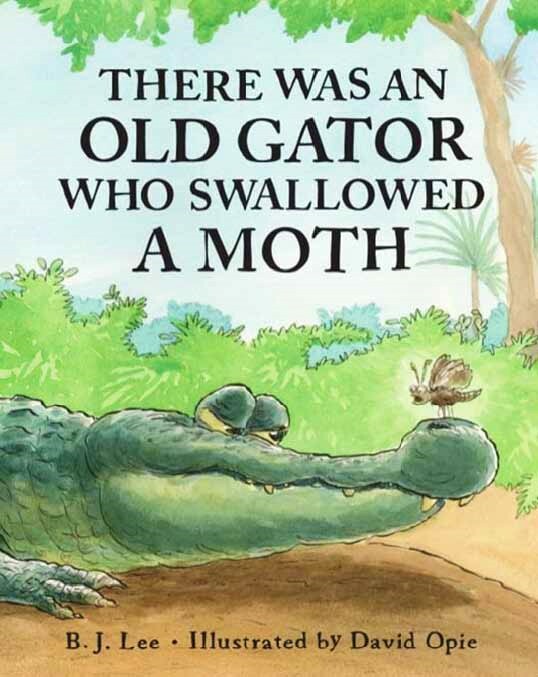 Her debut picture book, There Was an Old Gator Who Swallowed a Moth, is releasing on February 1, 2019 with Pelican Publishing. Additionally, she is an award-winning children’s poet with over 100 poems and stories published/forthcoming in major anthologies and magazines. Anthology credits include Construction People (Wordsong, 2019), I Am a Jigsaw (BloomsburyUK, 2019), National Geographic’s Poetry of US (2018), National Geographic’s Book of Nature Poetry (2015), One Minute Till Bedtime (Little, Brown, 2016), Moonstruck (Otter-Barry, 2019), Spaced Out (BloomsburyUK, 2019), and many others. Magazine credits include Spider, Highlights, and The School Magazine. 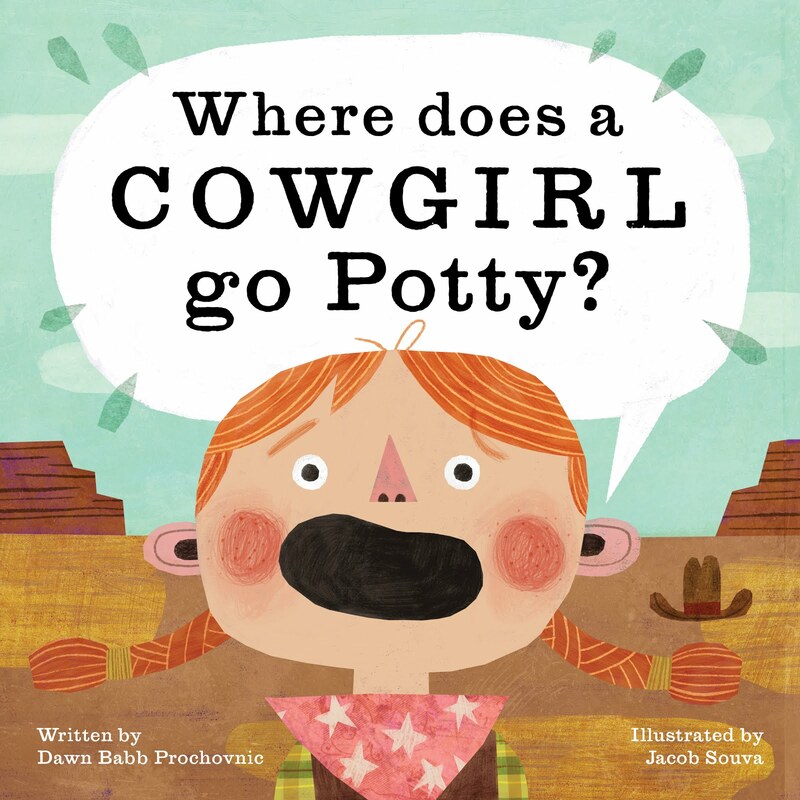 B. J. blogs at Today’s Little Ditty, where she is an authority on poetic forms. Connect with B. J. on Facebook and Twitter, or find out more at http://www.childrensauthorbjlee.com/. Thank you for having me, Dawn! You’ve been a pleasure to work with! Thank you for accommodating your schedule to fit in this swag post during my swag giveaway! Much appreciated! It was my pleasure, BJ. I learned a lot from your post, and I know others will, too! It was a real learning experience for me too! I’m glad the post will be useful! Great post! I love how you used swag to snag book reading opportunities!